If you are pregnant, your doctor or midwife has probably told you to avoid eating soft cheese because of the risk of contracting listeria, a bacterium that can cause miscarriage, premature delivery or death of your unborn baby. You may be wondering if cottage cheese is included in this restriction. You can safely eat cottage cheese, and doing so will add some beneficial nutrients to your pregnancy diet. Many soft cheeses are made with raw and unpasteurized milk, which makes them potentially dangerous during pregnancy. If cheese is not made with pasteurized milk, the bacteria that can cause listeria are not destroyed, leaving you at risk of contracting it. The most common soft cheeses that are not pasteurized include brie, queso fresco, feta, camembert, roquefort and gorgonzola. Make sure you the labels on your favorite cheeses to determine if they are made with pasteurized milk before you eat them. Cottage cheese is a soft cheese, but it is considered safe during pregnancy because most varieties are made with pasteurized milk. The American Pregnancy Association reports that cottage cheese is a pasteurized processed variety and can be included in a healthy pregnancy diet. It is still important to read the labels on your cottage cheese to make sure you are getting a pasteurized variety, because some unpasteurized varieties of cheese are available at supermarkets and farmer's markets. One of the most important benefits of adding cottage cheese to your pregnancy diet is the healthy dose of calcium you get. Calcium aids the development of your unborn baby's skeletal system, as well as the development of her heart, nerves and muscles. The Baby Center website recommends getting four servings of dairy products each day, and a cup of low-fat cottage cheese counts as one of those servings. You will get 125 mg of the 1,000 mg you need during pregnancy in your serving of cottage cheese. A bowl of plain cottage cheese is a healthy breakfast or snack, but you can add flavorful ingredients to enhance the taste. Chopped fresh fruit will add some important vitamins and minerals. Add melon, berries or pineapple to a serving of cottage cheese. 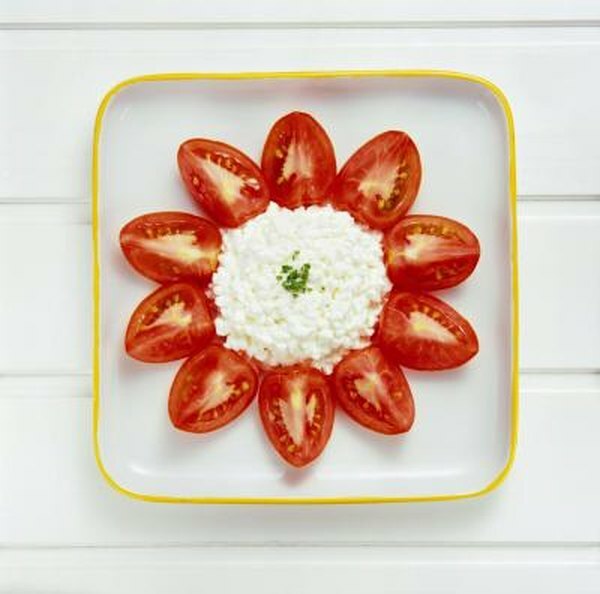 Fresh tomatoes or avocado also pair well with cottage cheese. Stir in some honey and cinnamon for a sweet treat, or spread on a whole-wheat bagel as a healthier alternative to cream cheese.